The markets lost their way in the post-noon session due to caution surrounding FII outflows and higher-than-expected inflation data released on Tuesday. Further, muted Q4 growth expectations from TCS, which will announce its earnings later in the evening, further dampened sentiments. 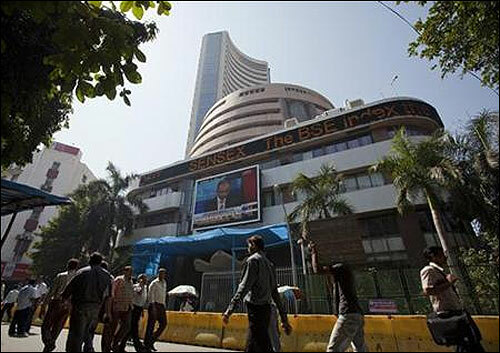 The Sensex ended at 22,277, weaker by 207 points and the Nifty ended at 6675, down 58 points. There was also pain in the hitherto-outperforming broader markets, with the midcap index ending at 7232, down 79 points and the smallcap index shutting shop at 7418, down 83 points. All the sectoral indices were gripped by selling pressure, with the sole exception of the defensive FMCG pack and metals. The current session has been no different. The domestic markets had started the day on a muted note, tracking the trend in SGX Nifty. Data showed that overseas investors sold shares worth Rs 216.3 million on Tuesday, the second straight session of outflows. And the pessimism seems to have only deepened in the later half of the day as the markets cose to ignore the strength prevalent on the Asian and European fronts. The headline WPI inflation had surprised the street negatively on Tuesday by rising above street expectations. The inflation reaccelerated in March to 5.7% Y-o-Y, the fastest pace since December. Wholesale price inflation reaccelerated in March as price growth across all the major WPI categories increased. Food price inflation ticked higher as vegetable prices rose quickly. The Consumer Price Index inflation also quickened to 8.31% in March 2014 as compared to 8.03% in February 2014 owing to higher inflation in fruits and vegetables which stood at 17.19% and 16.80% respectively during the month. On the global front, European stocks firmed up on Wednesday after better-than-expected growth data from China. Key benchmark indices in the UK, France and Germany raced ahead by from 0.7% to 1.06% each. Asian stocks also had a good day after China reported data on economic growth for the January-to-March period which was better than estimates. Key benchmark indices in Japan, Singapore, Indonesia, Hong Kong and Taiwan were up 0.08% to 3.01% each. Overnight, the US stocks had ended higher led by major corporates such as Coca- Cola and global pharma giant Johnson & Johnson. The Dow Jones had ended up 0.6% at 16,262, S&P 500 gained 0.7% and the tech-laden Nasdaq ended up 0.3%. And trading in US index futures indicated that the Dow could advance 69 points at the opening bell on Wednesday. The information technology pack ruled weak throughout the session, ahead of the Q4 results from Wipro and TCS. Infosys shed another 3.1% to Rs 3,156, extending its 3% decline from Tuesday’s high, on investor concerns about the company’s ability to bag lucrative contracts due to high attrition rate in the January-March quarter even as it posted a higher-than-expected net profit for the period. Wipro weakened by 2.9% at Rs 571 and TCS lost 2.5% at Rs 2195. The interest rate sensitive realty stocks nosedived; DLF (down 4.8%), D B Realty (down 4.5%), Indiabulls Real Estate (down 6.2%), Housing Development and Infrastructure (down 6.4%) and Unitech (down 5.8%) declined. On the other hand, ITC gained 1.4% at Rs 345. The metal pack saw selective buying interest; Tata Steel gained 1.3% at Rs 413 and Hindalco added 0.8% at Rs 135. In individual names, IndusInd Bank gained 0.6% to Rs 487 on reporting good Q4 numbers after net profit rose 28.83% to Rs 396.05 crore on 23.35% increase in total income to Rs 2702.19 crore in Q4 March 2014 over Q4 March 2013. Crompton Greaves surrendered early gains to end lower by 0.6% at Rs 177. Media reports had said that Hitachi, the Japanese maker of industrial power equipment and electronic goods, has emerged as the front-runner to buy the promoter's stake in the power transmission and distribution company promoted by Gautam Thapar. Jubilant FoodWorks raced ahead by 2.5% at Rs 1,004 after the RBI said that FIIs would be able to purchase up to 55% of the paid-up capital in the company. United Spirits edged higher by 0.4% at Rs 2864 after Diageo announced an open offer for a 26% stake in the company. The Adani group companies also witnessed renewed buying. Adani Enterprises strengthened by 3.4% and Adani Ports & Special Economic Zone jumped 3.8%. The market breadth was negative. Out of 2872 stocks traded on the BSE, there were 1091 advancing stocks as against 1651 declines. Pre-election rally: Will the markets bring more cheer? Which is the UPA govt's worst legacy?